Aviation Transit Control. The Aviation Transit Department works around the clock, 24 hours a day, 365 days a year. A team of professionals observe the Mexican sky to ensure security and regularity of air operations. Staff at this department is in charge of regulating air traffic control in a quick, secure and organized manner in order to protect the people traveling on planes, as well as the variety of aircraft flying on different routes. Radio support to air navigation. This service includes electronic devices that operate on VHF and UHF bands to provide orientation services, direction and distance information that aircraft use relating respect to the position of different airports. Aircraft pilots tune into them using channels, and with the on-board instruments, can easily arrive to or depart from destinations. Using radar, the controller can see aircraft at different altitudes and knows with precision the location of each using aircraft transponders. To make navigation possible within Mexican airspace, there are different features installed on land, which are used to establish aviation routes that help pilots get from one point to another, even in unfavorable weather conditions, in a safe and accurate manner. This network of air routes is called airways. Telecommunications. There are two major telecommunications systems: The Fixed Aviation Service (AFTN) and the Mobile Aviation Service. The AFTN is a telecommunications network that exchanges messages between aviation companies, national and international stations, and in general, aviation media. Transmitters and receptors are tools that flight controllers can use to communicate with aircraft pilots, both to transmit and receive messages from aviation control (mobile aviation service). These use VHF channels on the civil aviation band that are at each control tower and remote stations that link control centers and control towers through the National Microwave Network, Fiber Optic and Communication Satellite channels (a part of the Communications and Transportation Ministry). Meteorology. The Aviation Meteorology Information Service is performed by a group of meteorology experts specialized in aviation, who are in charge of monitoring weather conditions in order to provide airlines with prompt information. 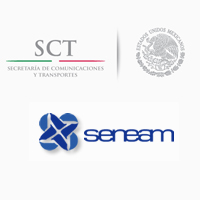 This information helps them safely and efficiently plan the course of domestic and international aviation operations carried out in Mexico. The Meteorological-Aviation Analysis and Forecast Center holds alphanumeric information generated by the national airport network, 24 hours a day, 365 days a year, and analyzes and predicts the evolution of phenomena and weather systems of low and high atmosphere, activity that is fundamental to assist in the safety, regularity and efficiency of air operations conducted in Mexican airspace. Aviation information. This service involves advising pilots when preparing flight schedules, which must be approved by the dispatcher. Pilots are advised in the previous stage with meteorological information for their advantage. Operating procedures are coordinated, and flight schedules are authorized by aviation authorities. The products that are provided to users include: meteorological reports, airway maps, altitude maps, Information on volcanic ash emissions (ashtam), information and notes on different airport conditions (notam), facilities and installations, monitoring of flight courses, and in cases of emergency, coordination with authorities for search and rescue.